Biomaterials for Oral and Dental Tissue Engineering examines the combined impact of materials, advanced techniques and applications of engineered oral tissues. With a strong focus on hard and soft intraoral tissues, the book looks at how biomaterials can be manipulated and engineered to create functional oral tissue for use in restorative dentistry, periodontics, endodontics and prosthodontics. Covering the current knowledge of material production, evaluation, challenges, applications and future trends, this book is a valuable resource for materials scientists and researchers in academia and industry. 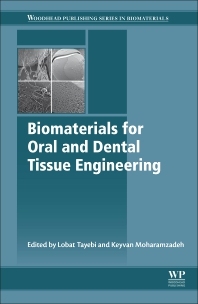 The first set of chapters reviews a wide range of biomaterial classes for oral tissue engineering. Further topics include material characterization, modification, biocompatibility and biotoxicity. Part Two reviews strategies for biomaterial scaffold design, while chapters in parts three and four review soft and hard tissues. Lobat Tayebi is an Associate Professor and Director of Research at Marquette University School of Dentistry. She received her PhD from University of California-Davis in 2011. She is a researcher in materials and regenerative medicine with multiple patents in the field. Her publication list comprises of more than 115 peer-reviewed articles including papers in Nature Materials and Advanced Materials. Her current research activities cover projects in smart materials, interfacial hard/soft tissue expansion, growth factor delivery, vascularization and stem cell seeding in patient specific 3D-bioprinted scaffolds, treatment of complex multi-tissue oral and craniomaxillofacial defects, and preservation of oral tissues. She enjoys interdisciplinary projects and has genuine believe in the effectiveness of multidisciplinary research. Keyvan Moharamzadeh is a Senior Clinical Lecturer and Honorary Consultant in Restorative Dentistry at the University of Sheffield, United Kingdom. He is a registered specialist in Prosthodontics, Periodontics, Endodontics and Restorative Dentistry and has been closely involved with undergraduate and postgraduate teaching and research at the School of Clinical Dentistry. He is leading multidisciplinary internationally recognised research in the field of Dental Biomaterials and Tissue Engineering and has extensively published in the literature and given numerous presentations in the national and international conferences. His research activities comprise tissue engineering; biocompatibility of dental biomaterials; synthesis and analysis of polymers and composites in dentistry; and physical and optical properties of dental materials.